Due to Hathurusinghe’s harsh derailing of solitary functioning wheel, in the ever-buckled SL batting chariot (unconscionably axed from 2018 Four Odis Vs Eng & recently Whitewashed entire series in Nz)…. again we face the dire need of a proven performer to do the vital Opener’s job in the upcoming ODI series in SA, followed by the 2019 World Cup in England. 2017 Jan to date ළන්කාවේ හොඳම ODI ආර්ම්භක පිතිකරු – The top ranked SL ODI Opener: Upul Tharnga – 1k Runs @ 40 av – 86 SR – 2 x100+ / 5 x50+ from 27 innings. Top Ranked vital cog in the top-order ODI batting unit with 80+ SR since Jan 2016 was removed at a crucial time like this…. just to further extend the grasping lives of excessively heavy, format-mismatched, abortive cargo like Kusal Mendis (last 27 Odis since mid 2017 – 366 runs @ 14 Av – 79 SR) & turtle-paced, selfish match-sinkers like Dinesh Chandimal (Since mid 2016 – 35 Odis -71 SR = targeted score 213) , Thirimanne (10 odis – 65 SR = targeted score195) in currently 300+ scores demanding modern ODI arena.! Before adhering purely to the NEVER worked-out Domestic highs & hypothetical Potentials based flopping experiments anymore, Selectors please LOOK at the Chrystal clear primary choice proven in International stage & his solidly credentialed WORLD Class (SL’s TOP ranked) achievements in the recent past…. In addition to over a decade maintained numerous overall records, in SL Odi history (a few of them). 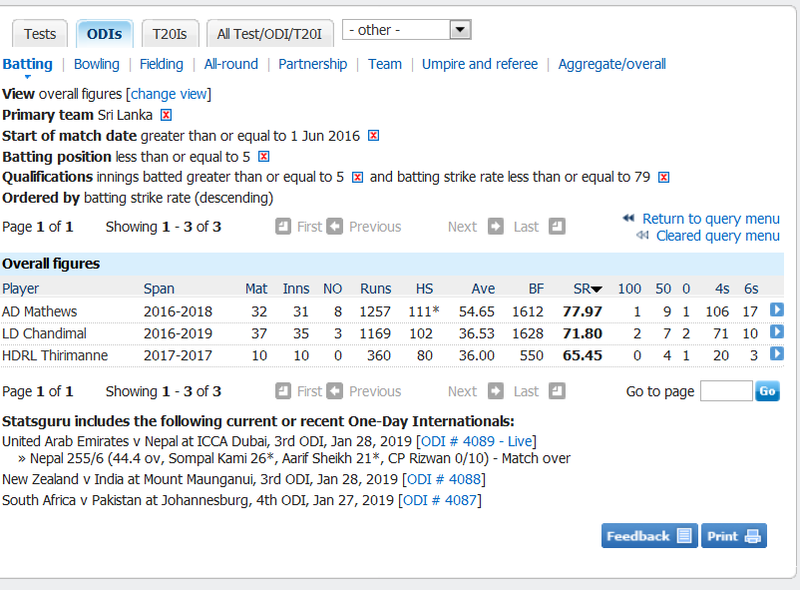 I request the Chief Selector Mr. De Mel & his selection committee to take a deeper look at the amazingly contrasting performance merits (all-time BEST as highlighted above) in those conditions of the most experienced Opener we have (proved with undeniably impressive top ranked batting records hided & never looked at before to give due recognition by SLC Statisticians). No need to say widely experienced senior pro Upul Tharanga’s performance records & progress shown in past 3 years are way above the rest of all, eying for the job of Opener. He is also the Most Productive Top ranked SL ODI Opener & Best Performed Top order (No1-5) ODI batter with 80+ SR who has the TOP Ranked SL ODI runs record in AWAY Series as well in past 2.5 yrs.. These are hard-earned PERFORMANCE proven FACTS that cannot be denied & put under the carpet for reasons beyond cricket, as seen so far… derailing our Nations’ hopes & pride. Since June 2016 ළන්කාවෙන් පිටත වැඩිම ළකුනු ගත් පිතිකරු – SL ODI runs record in AWAY Series as well in past 2.5 yrs.. Despite this prolific Opener’s above-all, well maintained overall ODI career record in past three years, even becoming the 3rd Best ODI batter in the World in 2017….. scoring 1k+ runs for SL @ near 50 Av & 90+ SR with 2 away Centuries (vs SA & Pk) & 6 x 50+ (including 95 Vs Ind) plus another 3 near-fifties (46 /49 vs Ind & unbeaten 44* vs Zmb)… Opener Tharanga’s progress was abruptly halted by the Coach Hathurusinghe (obviously after applying so much of parochial pressure, unsettling his mind)…just because of a lapse of a 50+ score in most recent 8 innings since his MoM award winning, SL’s only ODI series success (BD triangular series) stamped 50+ score in 2018. Over 3 years, 41 ODIs have been played by Upul Tharanga as a top order batter, Since 2016 Jan and that was only the (2nd ) SECOND occasion with a lapse of more than > FOUR (4) innings lapse in-between his 8 x 50+ (included 2 x 100+) in his unblemished record. In the previous occasion with such a short lapse, Upul responded with an unbeaten 112* in the 9th ing & another 61 in the 10th inning in the tough series Vs Pk in 2017. Note: Since Upul was unfortunately overlooked for 2015 WC (where Dilshan & Sanga improved their Averages & Strike Rates massively by few notches up on 300+ decks, under the ever-maximum FR benefits enjoyed by all in that WC), he missed the certain chance of scoring a few more Hundreds under those conditions prevailed at the time. Since 2011 WC (where UT was ranked as overall 5th Best batter with 395 runs @ 56 Av – 84 SR with 2 x100 & 1 x 50), as a top order batter, he had just a solitary OdI in ICC-CT in Eng 2016, where he made 57 runs @ 83 SR. Most recently Opener Upul Tharanga was asked to prove his current form & he proved it yet again, yielding 329 runs – scoring 2 x 100s & a 60+ leading the SL-A team to 5-0 whitewash as skipper in just concluded unofficial ODI series vs Ireland-A and available for upcoming SA tour. It is now up to Ashantha De Mel & his panel to give SL’s assertive Opener Upul Tharanga his due place in ODI side up to WC. Despite all those proven credentials to back this Opener, if the current Selectors also repeat the the same mistake by overlooking the SL’s 3rd BEST ranked batter in World Tournaments, by blocking his last WC appearance in England to serve SL …. as I see it, that should be considered as a NATIONAL CRIME. !